* Fixed the font problem... the correct fonts will now show (as seen in the preview). 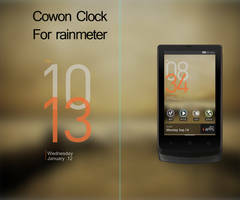 ~ All meters have two versions to achieve either a horizontal or vertical look. 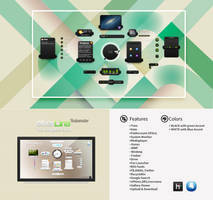 ~ Includes Color Changer & Configuration tools for easy customization and setup. 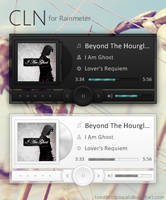 ~ The Color Changer alters accent colors throughout the skin with one-click (clock, music player, recycle bin). 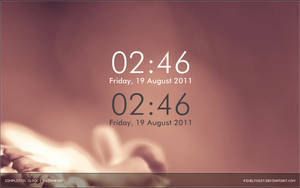 (*) The 'foo_rainmeter.dll' plugin [link] for foobar2000 must be installed. Thanks for looking, please enjoy. Thanks to for inspiring the ColorChanger. 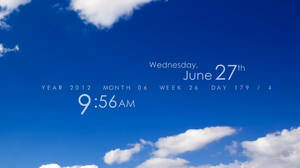 How can I change the font of the Clock? Hello, Im new to rainmeter, all I can do is download and install skins. 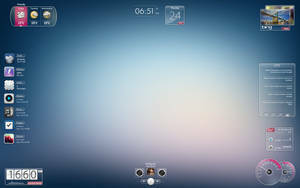 I heard about a plugin called chamelleon that makes your skins change collor according to your wallpaper. Is there any way to implement that plugin in this skin? An if yes how? you don't need a separate plug-in, you can already change the color of your skins according to your preference or a color that is well complement in your background just try to play with the settings or search a tutorial on google or youtube. 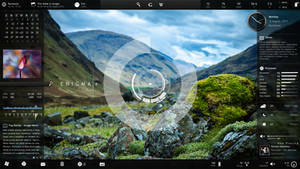 I do need a separate plugin like chameleon if my wallpapers change constantly like a slideshow. Right now it makes Rainmeter crash due to latest Win10 Update.....can you please update? I had to do a clean uninstall of Rainmeter today and Reinstall latest 4.3***, installed skin by skin and when it comes to Elegance 2 ist crashes immediateley! How can i change the size of the clock? Really good! clear, epured, what asking more...great skin Shizz! 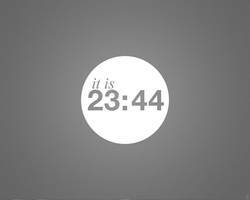 can i resize the clock ? 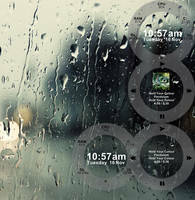 This is an extension for a program called Rainmeter. Start by installing that. Then, open the .rmskin file you downloaded for this skin/plugin and install it. 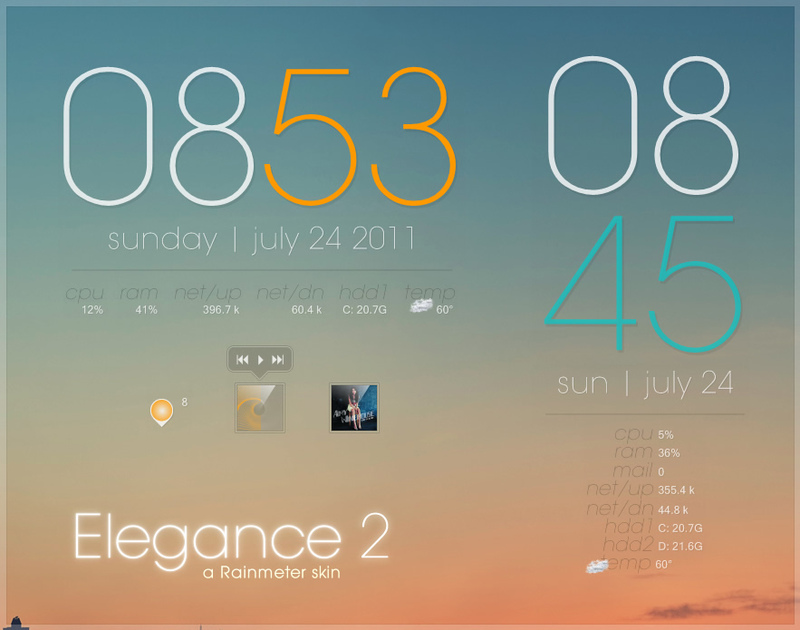 Next, in Rainmeter, you will see a few folders in the Skins tab. Click through them until you reach your desired .ini file a click load. You can then position it to your liking by dragging. 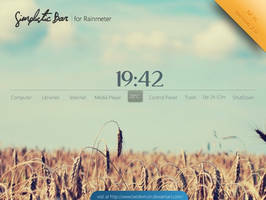 The requested URL /files/foo_rainmeter101.zip was not found on this server. That’s all we know. 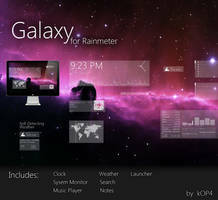 This is also the setting in my RainMeter configuration. Who can help? Do you have to change anything for full day names? "Fri" works without issues, "Friday" is cut off as "riday". Figured it out. I had the wrong version (horiz/vert) active. Stupid me. Love this skin! Any way someone smarter than me could turn it into a countdown? For say, the Chicago Marathon on October 8, 2017 at 0800 / 8AM CST? Whoa!!! That's an amazing skin!! Oops, my bad. It is funky but here's how you do this: When you're in the Manage Rainmeter app (right-click it in the system tray and click Manage), go to the Skins tab. 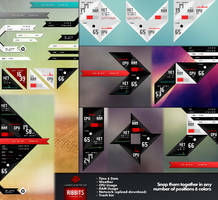 Now, select the Elegance2 skin and expand. Scroll down to the Config.ini file and select it. Now click the 'Load' button on the right just as you would for the other widgets. Voila! My apologies, lilshizzy. Would be nice to use it but the color changer and the configuration tool are not included in the download. 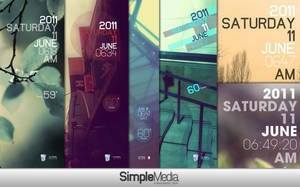 I love it..This is so cool..I like to use it as a wallpaper. I need to make the SYSTEM meters a little less transparent. I can barely see them in my desktop, how can i change this? I'd love to make them white. I can't get weather to work to save my life. 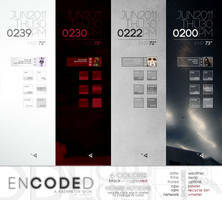 I've nevered my code 100 times, looked through the interal coding, and can't really find a place to put it there either. Can I get some help? I love this skin. Looks nice. It'd be nice if you could apply it to a phone. Hey. How'd I get this working with MusicBee? 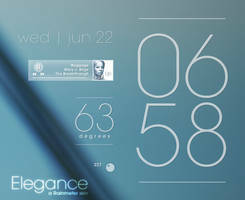 Do you happen to have the wallpaper for this theme? Is it possible to change month and day language to swedish? I know weather.com has an updated api and it could be the same for yahoo weather. I mean this hasn't been updated since 2011. But you can fix it by editing the weather_1 file. 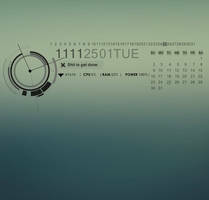 How to change, well, read the following: https: // forum .rainmeter .net/ viewtopic.php? t=23010 . I don't use the weather in this app so I'll leave it to someone else to figure it out. However the 1st post indicates going from api to xml. I dunno if that is compatible with this. There's a link in that post for a Weather Skin Tutorial. Weather doesnt work How to fix it ?